Dr. David Topping is a graduate of the Cleveland Chiropractic College of Los Angeles, and has been practicing for over 25 years. He is a Past President of the Blair Society, was Chiropractor of the Year in 1996 of the Blair Society, and is a Certified Advanced Instructor of the Blair Technique. He got interested in chiropractic when his own medical issue couldn't be helped by his doctor, and through chiropractic treatment, he was able to return to his favorite Southern California hobby - surfing. Dr. Topping has a direct pedigree straight from the creator of chiropractic. D.D. Palmer discovered chiropractic in 1895, his son B.J. Palmer developed it, and Dr. William G. Blair added new X-Ray views to better display the upper cervical spine, which became known as the Blair Upper Cervical Specific Technique - the specific form of chiropractic that Dr. Topping practices. 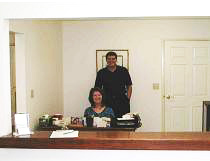 Dr. Blair taught Dr. Weldon Muncy, who in turn trained Dr. Topping. When you see Dr. Topping, you're benefiting from the purest and most expert form of chiropractic in the world. Dr. Topping is a native Californian and lives with his wife Pam in Fullerton. ©2009-2011 Topping Chiropractic. All Rights Reserved.